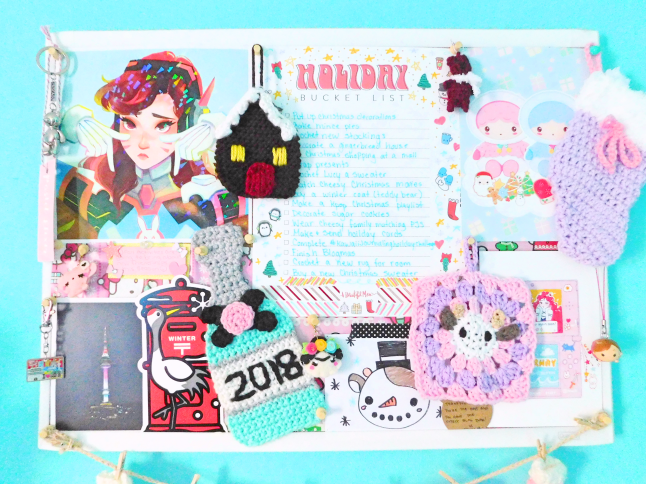 Welcome to my first Blogmas post of 2018! Back during Blogtober, I shared my autumn mood/dream board so I thought I would share my winter dream board with you guys. 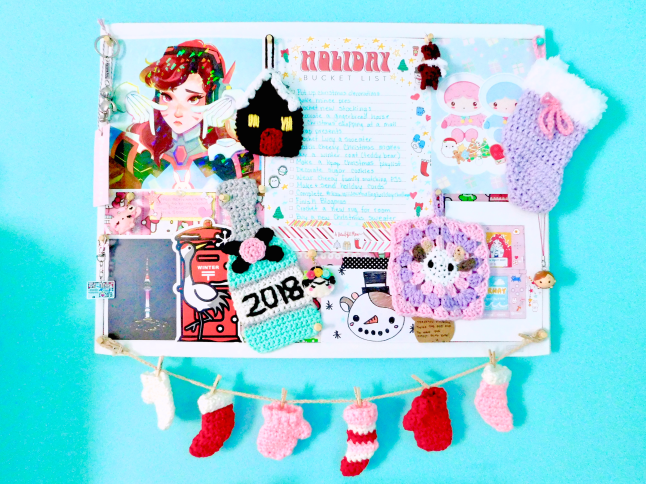 This is the first time I themed my bulletin board with a winter/Christmas/holiday theme. I don't love the traditional colors so I tried to add as much pastel colors as I could find. This time I won't explain everything in much detail so go check out my autumn mood/dream board post if you would like to see where a certain something is from. Here is a quick overview of my winter dream board. I kept the same position as my autumn board but replaced some cards, prints, and objects. Underneath the bulletin board, I washi taped some old gift wrapping paper to make it extra festive. 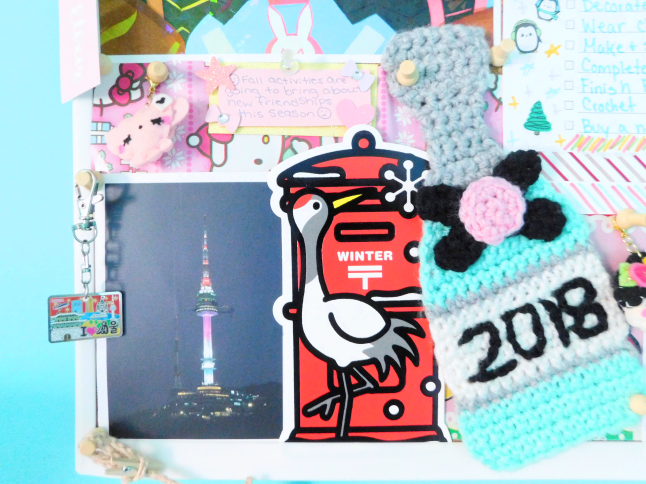 On the lower left corner, I have a postcard of the N Sal tower in Korea from a friend. Over that postcard, I have a teacup charm from LoveNeen. Next, to the postcard from South Korea is a postcard from Japan, which I bought off of eBay. The Frida charm is also from LoveNeen, I have it displayed on here because I think it's really cute! 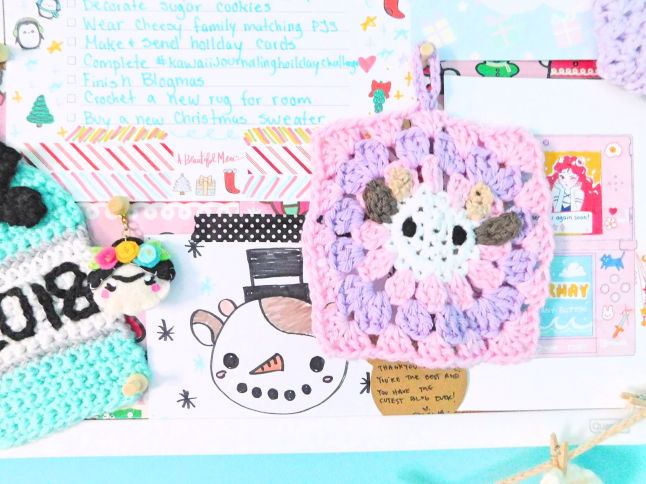 That Mooey Snowman card I drew as an outline for my Christmas crochet cards. The Mooey granny square is a Patreon-exclusive that you can get if you sign up for my Patreon. Underneath, I have a cute note from a friend. 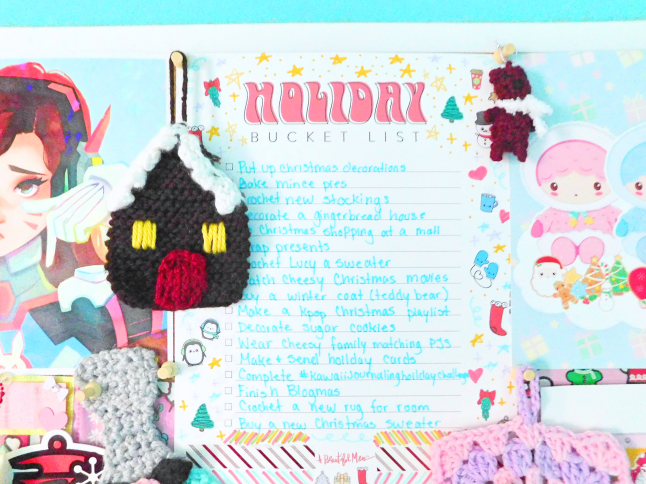 On the upper righthand corner of my board, next to my bucket list is an adorable Little Twin Stars print from HelloPaperCat. 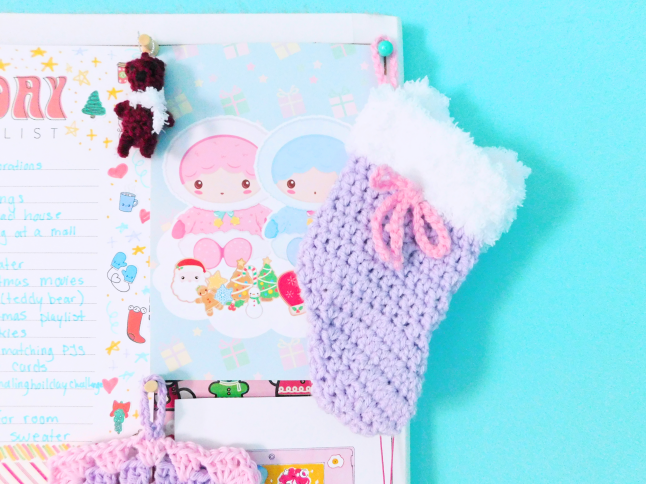 The pastel bear stocking is a reward for my Patrons this month. If you would like your own go and sign up to my Patreon. 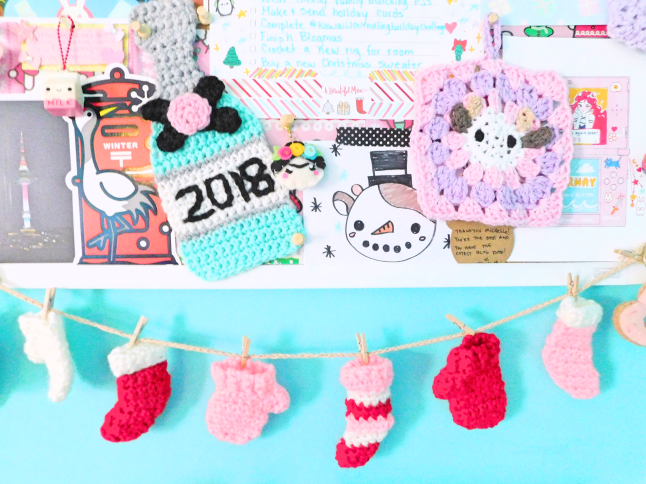 I will be posting lots of cute holiday content this month, including extra crochet patterns that I won't be posting on my blog anytime soon! At the bottom of my board, I strung my crocheted winter garland. You can make your own here or buy your own here! In between the handmade ornaments, I have my copy of the holiday bucket list from A Beautiful Mess. Instead of making a separate post on my bucket list I'll just share it here.